My good friend Claire Russett has a new release today! 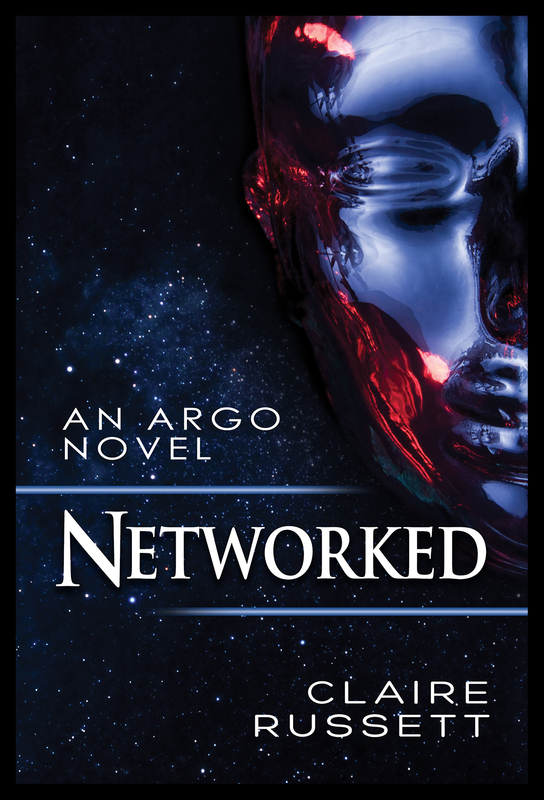 Networked is the second in set of stories based on the space station Argo. Claire tells me that when she originally wrote Catalyst, the first in the Argo series, she had no idea she would be writing any more books set in this universe, but that she became intrigued by Chris and Duncan, and decided that she had to tell their story. Based on this blurb, I can see why! Major Duncan Harris is a Union soldier serving aboard the space station Argo, leading one of the station’s exploratory teams. He is quiet, reserved, and has sworn off any personal relationships since his last one ended messily. Besides, working closely with various team members makes him uncomfortable. One of Argo’s engineers, Dr. Christophe Vabre, recently started serving on Duncan’s team. Chris is slowly getting to know Duncan, but Duncan seems determined to keep him at arm’s length, and his mixed messages confuse Chris. When, on one of their missions, they discover a piece of technology that allows people to share their thoughts, Chris never imagines he’ll use it with Duncan—or that the machine will reveal the depth of Duncan’s true emotions. Duncan is horrified to find himself not only sharing his feelings but forcing Chris to reciprocate his advance. Mortified, he flees Chris’s lab—but before Duncan can discover the truth, an attack on Argo forces the station to evacuate. He and Chris will have to team up one more time if they want to save their home. MM Good Book Reviews has already given it a 4 Hearts Review! Networked is now available as an e-book and paperback today from Dreamspinner Press! In other news, I just purchased my plane tickets for Galacticon 3 in Houston May 23-26! I’m going to be co-hosting a panel discussion on Fanfiction: It’s All Grown Up, and assisting in a writer’s workshop along with fellow author Anna Butler and chain mailler/editor Jennifer Roberson. I’m so psyched about having this lovely excuse opportunity to attend the 35th anniversary of Battlestar Galactica! Not to mention, ComicPalooza is being held the same weekend in the same convention center! Maybe I’ll have an excuse to bring along my Peggy Carter costume, eh? As part of the writer’s workshop, Galacticon is holding a open call for short stories in a fanfic contest! You don’t have to attend the con to enter the contest, so if you know of someone who writes BSG fanfic, or if you want to take a crack at it yourself, check out this link! But hurry, the deadline is coming up soon! And to give you an idea of what you might expect if you come to Galacticon, here’s a sneak preview with Richard Hatch! This entry was posted in Uncategorized and tagged announcements, Battlestar Galactica, Dreamspinner Press, Peggy Carter, reviews, Sarah Madison, upcoming release by Sarah Madison. Bookmark the permalink.